We want our locations to be unmistakable, yet to still respect the original building. - Mom+Pop, Ltd.
We want our locations to be unmistakable, yet to still respect the original building. 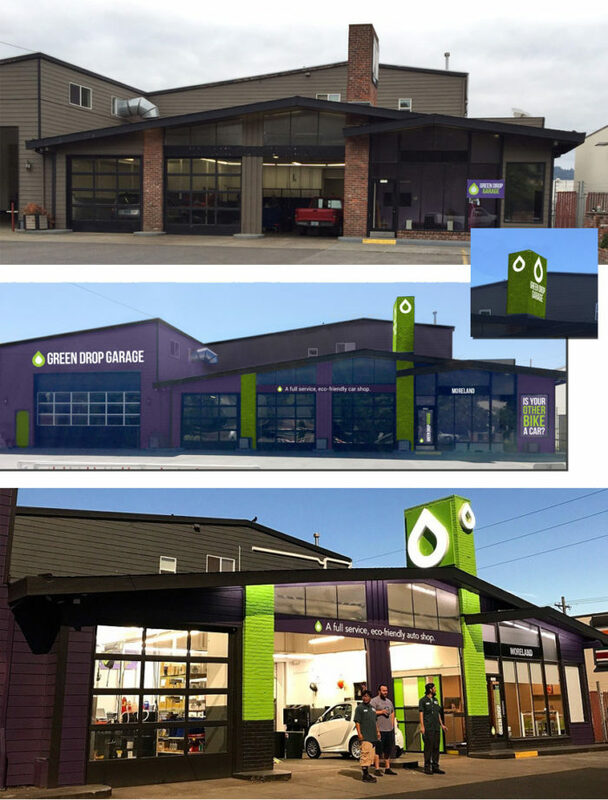 After Green Drop Garage expanded to a second location, it was clear that both locations needed some serious exterior work. Farhad wanted to stamp his brand on each location, but was unsure of how to accomplish this due to the unique nature of the buildings. 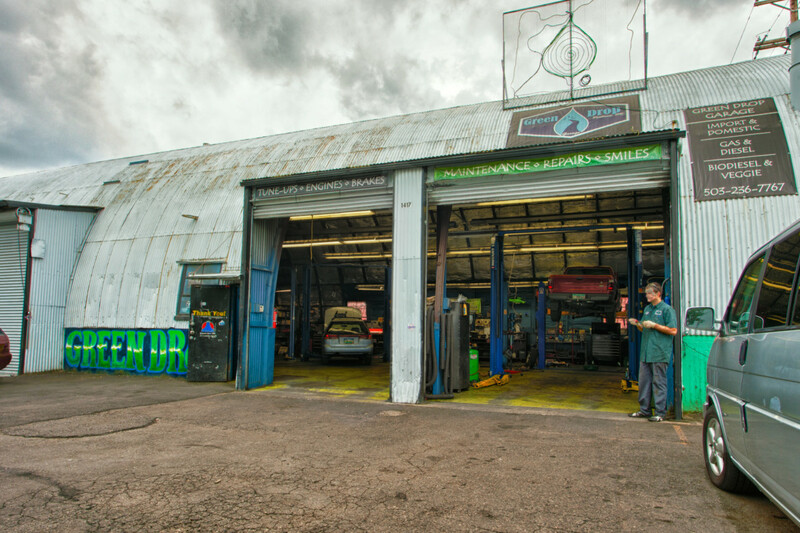 In the early days of just one shop location, a couple of mechanics, and no real corporate profits, a shoestring budget is probably a generous description of what we had available to us. The faded blue corrugated Quonset hut leaked when it rained, and was heated by car fumes. Still, something had to be done. A couple of worn, comfortable couches and a Lay-Z-Boy transformed the waiting area into... something. But it was progress. The original blue Quonset hut and the "amazingly comfortable and newly redesigned" customer waiting area. Eventually, the state of the building exterior needed to be addressed. After mocking up a number of paint options, we decided that the first phase of the project would be to just put some paint on the building. And it needed to be purple. 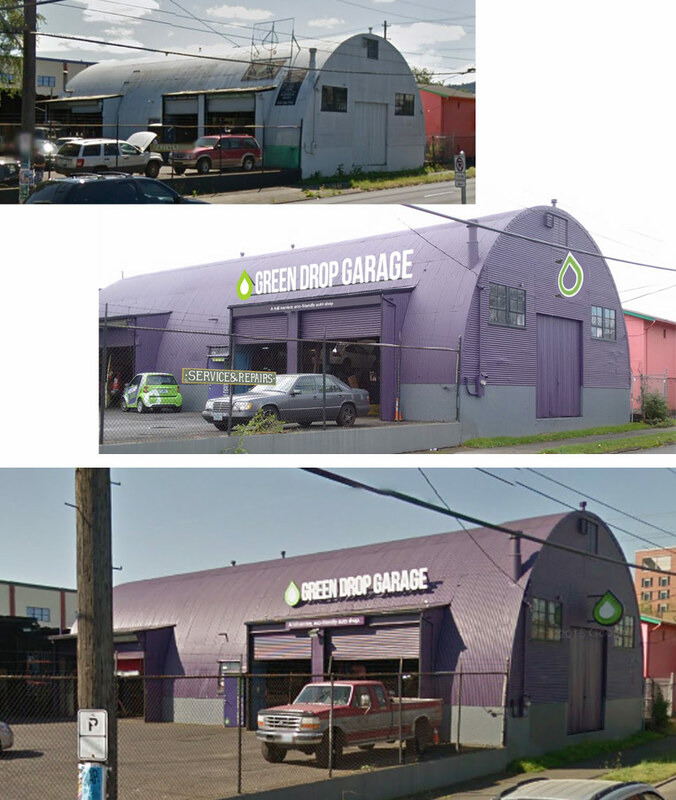 The building existed as a plain purple Quonset hut for several years, until Farhad acquired a new location in Eastmoreland that was in desperate need of some exterior treatment. 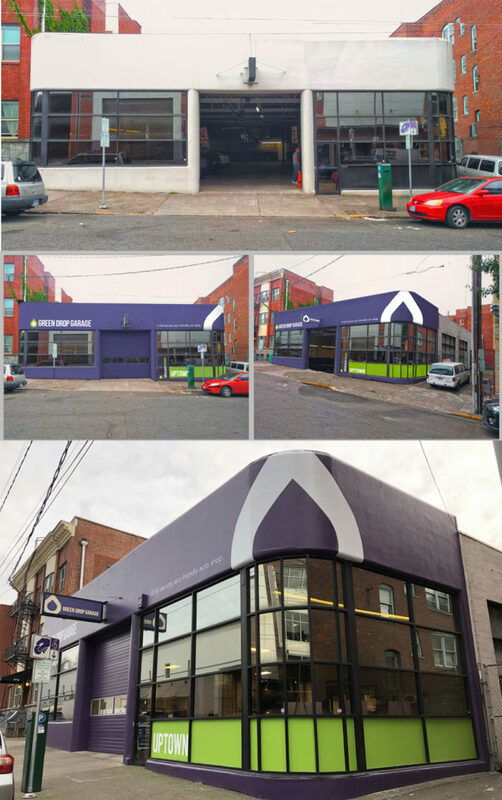 This new location took priority over the purple hut, but provided an excellent opportunity to codify exterior signage and paint guidelines that we could apply to the current and any future locations. These exterior branding guidelines ended up with the simple idea that we would commit to respecting the architectural nuance of the original building design and to selectively update those elements to fit the Green Drop brand. The common thread we would draw between these two and all future locations includes the long horizontal brand signage and the location name featured prominently above the entrance. Any additional signage would be informed by the building's architecture: Central got a neon drop hanging off the building's end cap; Moreland's chimney was emblazoned with a white anodized aluminium drop and two giant acrylic-fronted glowing white channel-lit drops.